Drush make is an extension to drush that can create a ready-to-use drupal site, pulling sources from various locations. It does this by parsing a flat text file (similar to a drupal .info file) and downloading the sources it describes. In practical terms, this means that it is possible to distribute a complicated Drupal distribution as a single text file. ; Make file for Art Websites. ; Because you will always be using these two contributed modules. 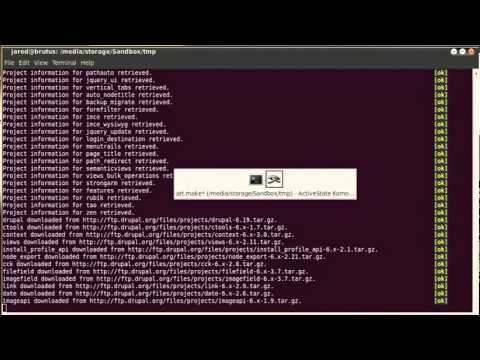 If you give this file to Drush make it will go to drupal.org and download the latest version of Drupal and unpack it in the directory where you ran the command. Drush make will also download the latest releases of views and cck and unpack them to the sites/all/modules directory. That is it! If this is all you ever used Drush make for you have a huge win already because that has saved you a significant chunk of time, but this is only the beginning. This will allow for more control over what version is downloaded by Drush make. 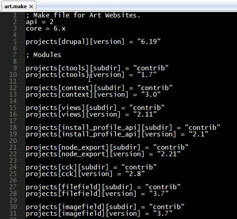 Now Drush make will extract those projects to sites/all/modules/contrib. You can see the type option above is set to “get”, this is the option that can be changed to “svn” or “git” to change the protocol you are using to fetch your code. You can also see that I have specified a directory for the jQuery UI library to be extracted to- slick! If you would like to download my example make file to try out and hack on right click on this link and choose “save as”. Finally I want to show how to use this file we have so carefully crafted. Open up a terminal and navigate to the place you would like to build your site, maybe some place like /var/www. I like to copy the make file to the directory I am building the site in, so copy the file there. Once you are in the directory and the only thing in the directory is the make file run the Drush make command and it will execute the file we have written(I have named my file art.make). hit enter and watch it work. The “-y” at the end of the command tells drush make that the answers to any questions it may ask is yes, you can leave it off if you like but you will have to answer the questions manually. We now have a code base ready to install. If you used the example make file that I linked above you may have noticed that there is a profile that was downloaded to the profiles directory. This is the subject of the next post in this series. This profile will perform the 2nd step in the process of building our base site to hit the ground running. Drush make has changed the way I set up a Drupal site. With very little difficulty or effort you can set up a file that gets you going quickly with a solid code base. Once you start to use Drush make you will realize that I have only touched on the power of the functionaility. Soon you might find yourself patching files with Drush make, recursively calling make files in other make files or even using Drush make to build platforms in Aegir. We build sites that are accessible using code that follows standards. 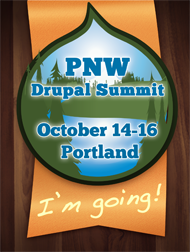 I will be attending the Pacific Northwest Drupal Summit.